You can't mistake the song of a robin for any other birdsong. It is a melody synonymous with Spring, a time of renewal, and its song is a reminder that you have a song of your own. It is time to take creative control of your experience, so sit in the sun and set some goals! Robin may be bringing you the message that its time to take control of your own life, and that means detaching from the drama and experiences of the lives of others. 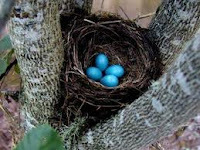 Robins lay eggs of a distinctive turquoise color. Eggs represent the creation and incubation of an idea, opportunity, a new beginning. Unrealized potential. Turquoise is also a semi-precious stone with metaphysical qualities of its own, that I am also drawn to applying here. Turquoise is sacred to both Native American and oriental traditions. It is associated with the sky, and bringing sky energy to earth, in other words bringing ideas to physical form. It is connected to the throat chakra, which assists with clear communication that is heart based. It attracts abundance and is known to possess healing qualities. If you have seen a robin, or heard its sweet song today, the Universe is nudging you to dare to dream, dare to take that first step. Life is here to be lived, what are you waiting for, permission? To be true to yourself, you first have to get to know yourself. Are you absolutely sure that you want what you want? Ask yourself why you really want it. Have the courage to speak candidly and truthfully to the people in your life...don't forget, you are an advocate for YOU. A whole new way is opening up in front of you. All you have to do is take the first step.